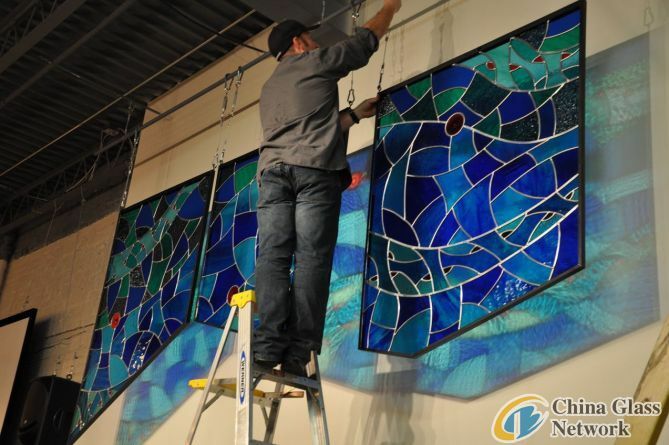 When a new Seventh-day Adventist congregation decided to add a contemplative and inspiring element to their modest church on Chattanooga's Southside, they commissioned local stained glass artist Todd Grafe to create a modern, nontraditional work to be a focal point. Grafe took his inspiration for the three-panel installation from the name of the church, The Well, tto design the piece that represents water moving across each panel. Ripples reflect on the wall behind the suspended installation, underscoring the motif. The artist is inspired by the shapes, patterns and textures in nature and said he likes to spend time at museums and looking at other artists, working to stay familiar with trends and design ideas. "Design is one of the harder parts, but once I cut the first piece of glass, things move along pretty quickly," he said. The original art created for the church took Grafe about eight weeks to make and includes more than 200 individually cut pieces of glass, including five antique handmade red rondelles from Germany. "They have been in my family for about 30 years. I don't usually use them in projects. I tend to keep them for myself. This was a special project," Grafe said.